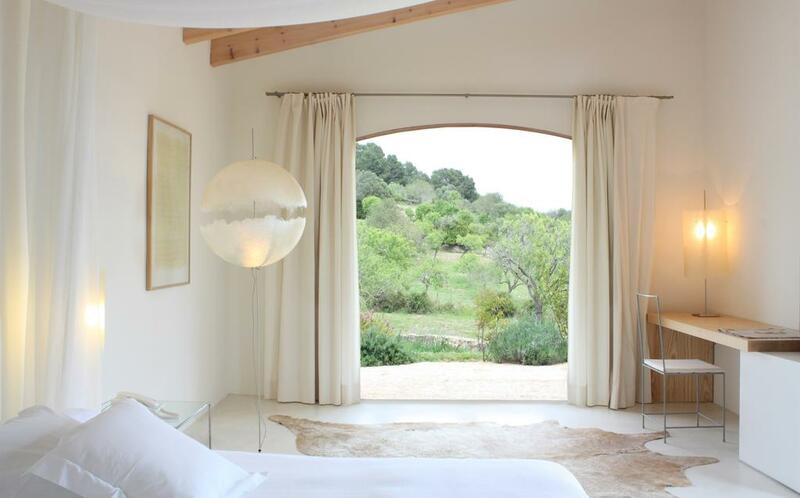 The 5 most attractive boutique hotels in Mallorca. The beautiful can be so close…..
We do not have to travel around the world when there are wonderful places nearby with fantastic nature and paradise beaches. Book your trip to Majorca, where you will find spectacular nature, great beaches, exquisite gastronomy, beautiful villages and hospitable people. Here 5 of the most charming boutique hotels in Mallorca, where you can feel and enjoy the essence of the island day and night. Country tourism for families, boutique hotels & romantic getaways for adults only. Be inspired and have fun on your trip. We look forward to receiving your feedback! 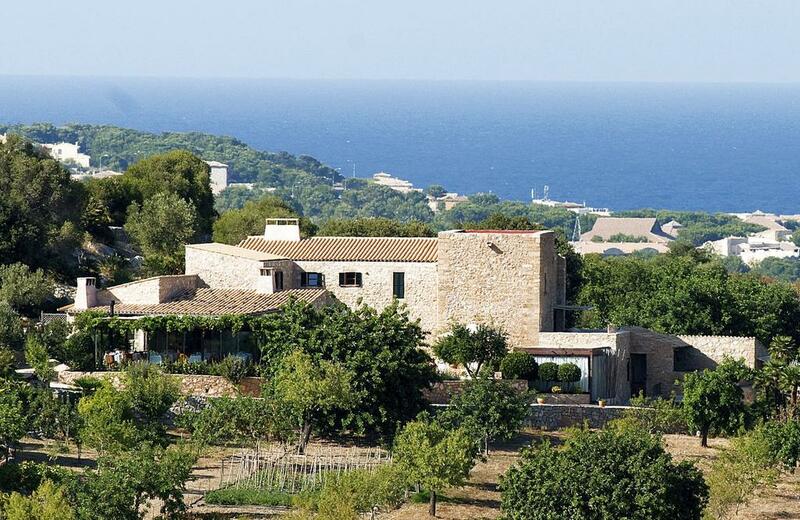 `Cases de Son Barbassa’ is a luxury agrotourism situated in the heart of the natural park Llevant, 5 km from the bay of `Cala Ratjada´ and very close to the Cala `Mesquida bay´ and the medieval complex of `Capdepera´. The hotel is situated on a 125,000 m² estate with almond, olive and carob trees as well as aromatic plants. In the garden is the swimming pool with a sun terrace and hammocks and an outdoor Jacuzzi, as well as a wellness area with various treatments and massages. 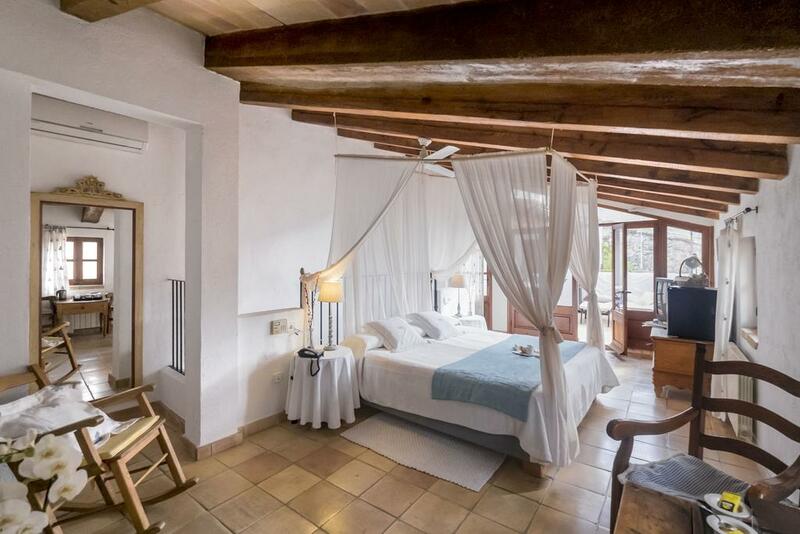 The spacious rooms are comfortably furnished and preserve structures such as old stone walls and wooden beam ceilings, all with hydromassage bathtub or shower and incredible panoramic terraces. There is a choice of superior rooms, suites and family rooms, with the possibility of connecting rooms. The restaurant offers Mediterranean cuisine of proximity with fresh products, some even from the farm, breakfast and dinner can be enjoyed on the outside terrace. Relax in the wonderful Cases de Son Barbassa. Book Now! Designed in white and neutral tones with functional, modern and simple decoration, the hotel has preserved its original character, increasing comfort and relaxation. The living room with fireplace also contributes. The hotel has 10 junior suites, all with access to private garden or terrace. In the garden is a lovely outdoor pool with a terrace surrounded by almond, carob and olive trees. The hotel has a spa with indoor pool, jacuzzi, sauna, hammam and wellness area with treatment facilities by therapists. The restaurant offers organic cuisine with products from its own garden, its own eggs, fresh fish of proximity and organic meat, completed by a variety of wines from its own wine cellar and a wide selection of Majorcan wines. For golf lovers there are 4 golf courses in the surroundings of the hotel. Thinking of Majorca, spectacular beaches and bays come to our mind, but after a stay in Valldemosa, this beautiful place will always shape the image of Majorca. A picturesque village with stone streets and splendid flowers, a relaxed and quiet place that you must visit. This charming boutique hotel on a property with stunning gardens and terraces, laid out on different levels with great views, spreads the same charm as Valldemosa. In the garden you will find an outdoor swimming pool, indoor spa area with heated pool, jacuzzi, sauna and wellness area with beauty treatments and massages. Staying at this boutique hotel is like a dream, with spacious rooms, from 28 m² superior rooms to 60 m² suites, all with king-size beds and balconies, or private terraces with hammocks, tables and chairs. The rooms are individually decorated in a stately style with precious wooden furniture, and bear names of famous personalities. The idyllic restaurant with its cozy dining room and a fantastic terrace with spectacular views, where you can dine under the starry sky, offers fresh products of proximity à la carte or as a Majorcan menu. Fall in love with Valldemossa. Book now! Only 3 km from the bay of `Cala Sant Vicenç´ and 6 km from `Puerto de Pollensa´ is this unique hotel with family charm. A house complex from the 17th century, restored with refinement and transformed into a luxury hotel with all amenities. The houses are spacious and have a fully equipped kitchen, ideal for a family stay. In the garden there is a swimming pool and a sauna, pool and beach towels are provided. Guests can rent bicycles and use the free airport shuttle service. The restaurant serves Mediterranean dishes that can be enjoyed in the dining room or on the fantastic outdoor terrace. Dreamlike orange groves and Arabian canals adorn the spectacular property of CA N’AÍ, an oasis to relax. 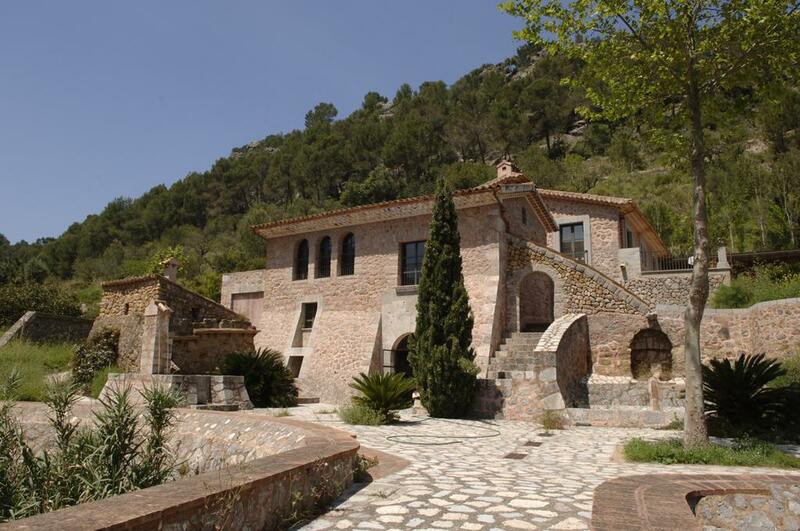 Surrounded by the Tramuntana mountains and 2.5 km from `Sóller’ and` Puerto de Sóller’. This paradise is reserved for adults (hotel only for adults). This charming country hotel, with its stone walls and wooden beamed ceilings, its simple décor in white and earth tones and fine wooden furniture, has a rustic, rural charm. The rooms are spacious, with large windows that offer spectacular views of the mountains. In the outdoor area, the pool is located in a relaxation area with hammocks and a bar for refreshing, you can also enjoy wellness treatments outside. The restaurant of the `Ca N’Aí´ rural hotel offers you Mediterranean cuisine with products of proximiy and from its own orchard, like the fresh oranges. Enjoy the food in the dining room, in the courtyard or on the beautiful outdoor terrace. In the evening, you can relax in the chill-out area with a delicious cocktail and stunning views. If you want to enjoy outdoor activities, the Tramuntana mountain range offers many hiking trails, bicycles are available in the hotel. If you have not found your hotel, stay calm! 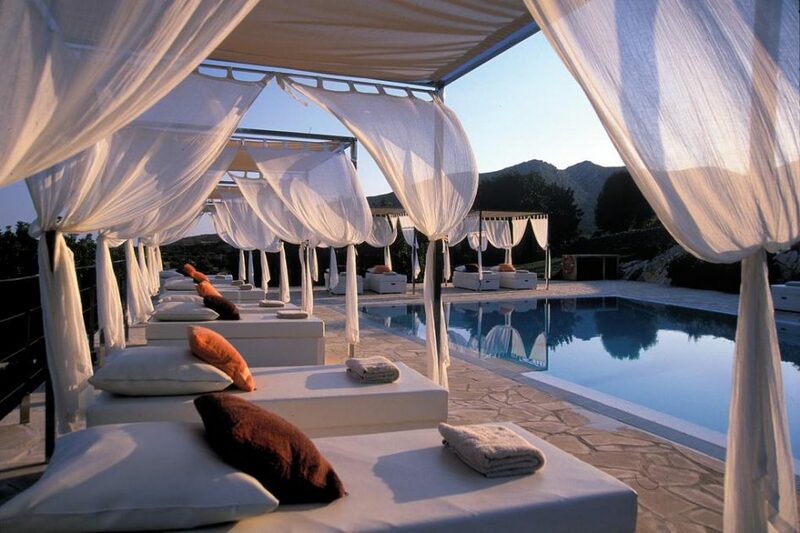 `Nomolesten´ offers you more charming boutique hotels in Mallorca.